Data is the source material or content in the form of facts or non-facts that serves as a basis for generating information. Information is a product of data that has been processed into a format understandable by its intended audience. Knowledge is ways of knowing obtained through sensory experience (seeing, hearing, tasting, smelling or feeling). Understanding involves an interpretation of the knowledge. Decision requires application of the understanding based upon situation-specific criteria. Source: Theory as a Foundation for Military Operations: Data, Information, Knowledge, Understanding. Click here to see the original model. The model above is an adapted view of the DIKUD continuum with application to LL. 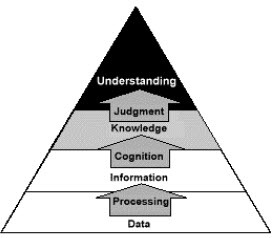 Knowledge is a fluid mix of framed experiences, values, contextual information, expert insight, and intuition that provides an environment for evaluating and incorporating new experiences and information (Tiwana, 2002). Knowledge is a system of connections between facts and ideas (Tywoniak 2007).